Dr Bingu wa Mutharika (born February 24, 1934) is a Malawi economist, politician, and the current President of Malawi. He first took office on May 24, 2004, after winning a disputed presidential election. 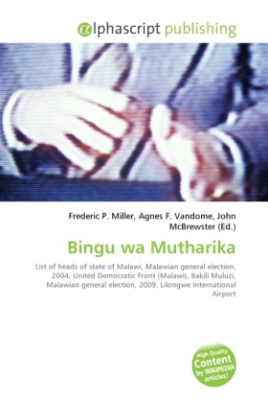 With the support of President Bakili Muluzi, Mutharika won the 2004 election as the candidate of the United Democratic Front (UDF), he broke with the UDF (which remained under Muluzi's control) in February 2005, however, due to disagreements over Mutharika's anti-corruption campaign. He then formed a new party, the Democratic Progressive Party (DPP), but lacked a parliamentary majority for the rest of his first term. He won a second term in the May 2009 election. His supporters credit him with responsible policies that have encouraged economic growth.